1. Add dry ingredients (flour, yeast, sugar and salt) to a large mixing bowl and combine well. Make a well in the center of the dry ingredients and add liquids. Note: the milk and butter should be warm to activate the yeast, but not hot. 3. Mix and knead with your hands — it will be messy and sticky at first, but it will come together. If needed, you can sprinkle more flour on the dough and incorporate it as you knead. You want your dough to form a ball and be tacky like the back of a piece of tape. Leave your dough in the bowl and cover the bowl with a kitchen towel. Let your dough rise for 30 minutes. To ensure a good rise, set the covered bowl in a warm place. 4. When the dough has risen for 30 minutes it will be slightly puffed. 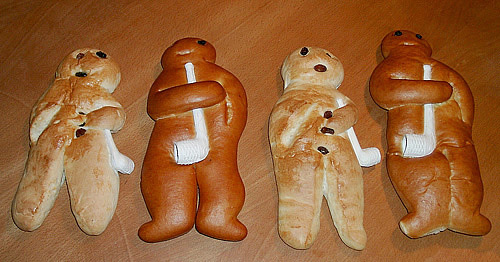 Cut the dough in half and then in half again so that you can make 4 fellows or whatever shape you like (you can even use smaller portions to bake mini stutenkerl). Before shaping the dough, knead for a few minutes on a lightly floured surface. Shaping the figures right on the parchment-covered baking sheets that you will be baking them on is best so that you don’t have to worry about transferring them. Let the little fellows rise, uncovered on baking sheets for 20 minutes in a 175 degree F oven. 5. After the second rise (they will be quite puffy), decorate your stutenkerl with raisins, them brush the tops with beaten egg yolk. Bake at 380 degrees F for 20-25 minutes until they are shiny and golden on top and a skewer poked into the bread comes out clean.